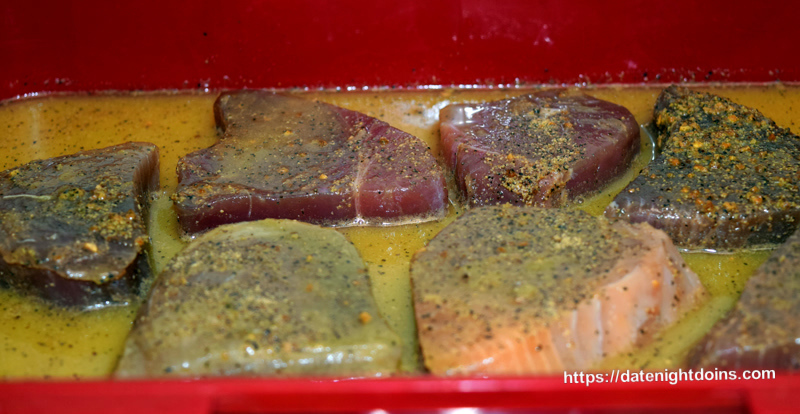 Citrus Ahi Tuna Steaks Smokin’ on Your Gasser was a quick and easy recipe on our gas grill. Something a bit different for tailgating. Tons of flavor with only three marinade ingredients. Your friends will adore you as a “Grill Master”. Easy to serve in a slider bun, on a plate or wrapped in a tortilla. A real treat with a “Kiss of Smoke” using a Wedgie with Pacific Pellets Gourmet Blend. Place tuna in “Marinator” or plastic bag. Whisk marinade ingredients and pour over tuna. Preheat the grill to medium high heat and light your Wedgie. Spray the grill grate with cooking spray, we used “Duck Fat” (see our store). Season the tuna with the Chef of the Future and place your Ahi Tuna directly onto the grill for about 2 minutes per side. Note that your cooking time will vary due to the thickness of your tuna. You don’t cook Ahi Tuna to this, but U.S.D.A. safe is 145* (62c). Keep in mind that the fish will continue cooking for another 5 to 10 degrees after you pull it off the grill. I use a Maverick ProTemp Instant Read Thermometer for checking meat temps.